Start with a walk through the vielle ville or old town. Begin down by the harbor — divided into the old port and the newer Port Vauban, for a look at how the other, immensely rich half lives, or floats, in their super yachts. It’s a far cry from the days when Guy de Maupassant moored his boat in the small port in 1886 while staying at La Bastide du Bosquet and writing short stories and the novel Mont Orio. From here, walk back through the old stone arch towards the market where stalls overflow with fruit and vegetables. Grab a table and a crêpe at Le Qu4tre (4 cours Massena, tel. : 00 33 (04) 93 34 84 83) to watch the action. You can wander through the little streets behind the market or walk along the ramparts on the Promenade Amiral de Grasse where the views out to sea are magnificent. The picturesque Château Grimaldi dominates the skyline. Today it houses the Musée Picasso (see next page), a delightful museum with a small but very good collection. Picasso lived here in the autumn of 1946, donating the paintings and drawings he produced to the town. The medieval church of the Immaculate Conception was once a cathedral. Despite the downgrade, it’s a pretty site with its wooden sculptured façade and well worth stepping inside for its crucifix of 1447, and a Virgin sculpted in 1515. Head south along the ramparts to the delightful Place du Safranier, the heart of the very small, free commune of the Safranier, created after World War II. It’s known for two things: the place where Nikos Kazantzakis wrote Zorba the Greek (he lived at no. 8 rue du Bas-Castellet), and the excellent bistro, La Taverne du Safranier, (1 rue du Safranier, tel: 00 33 (0)4 93 34 80 50). It's a casual, welcoming place where the fish is the best bet. A stroll of a hundred yards or so takes you south to the Musée d’Archéologie, which covers 4,000 years of history discovered in and around Antibes. Turn back from here and wander through the little cobbled streets to the covered marketplace. It’s easy to get lost, and just as easy to find yourself again. In 1946, Picasso came to live in the Château Grimaldi and was so delighted with the place and the views out to sea that he later gave a large number of his works to the town. With other donations, notably from Jacqueline Picasso in 1991, the collection grew and now includes paintings of mythological beasts and Mediterranean sea images as well as a wonderful collection of ceramics that are worth the visit alone. When there is no major exhibition, you’ll also see the vibrant, richly colored paintings of Nicholas de Stael, who lived, and died, in Antibes. June 15th-September 15th: Tuesday to Sunday 10 a.m.-noon; 2 p.m.-6 p.m.
September 16th-June 14th: Tuesday to Sunday 10 a.m.-6 p.m. The Cap d’Antibes is a promontory running south from Antibes and Juan-les-Pins. Long and narrow, it’s easy to walk across from west to east but if you want to explore a bit more and have time, either take the very local envibus and stop off at different places, or drive. It’s a wonderful, wooded, hilly area, full of chic villas you find down little lanes that lead to nowhere except a great view. The jewel in the crown is the stately Hotel Eden-Roc. Other places to see include the Musée Napoléonien, and the mid-19th-century Villa Eilenroc, home to a classical music festival at the end of July. If the weather is punishingly hot and you crave greenery, walk through the Jardin Thuret, created by the botanist Gustave Thuret in 1857. Not to be missed is the little La Garoupe Sanctuary chapel with its ships and models; this fishermen’s chapel is full of evocative reminders of those lost at sea. The nearby lighthouse is one of the most powerful on the coast – the beacon can be seen for 52 kilometers (25 miles) out to sea. Antibes has more than its fair share of artists who fell in love here and painted the small citadel town on the Mediterranean. The town has now celebrated their fame by putting stands at all the places where the artists set up their easels and captured the scenes forever. Pick up the Tourist Office's easy-to-follow map which takes you around all the stands showing the original works of art. The guided walk takes you from cours Massena, showing the marketplace before it was covered with the present cast-iron structure as painted by Emile-Charles Dameron, past the view of the l’Ilette by Eugène Boudin painted in 1893. There’s a Claude Monet picture of Antibes with the snow-capped Alps in the background, a view from the boulevard de Bacon and a delightful picture by Ernest Meissonier of riders on the Salis beach in 1868. There’s also a recognizable Picasso, though it’s a trifle abstract. Many of the originals are in museums in the U.S.A. so you may well recognize them. It makes discovering the real view interesting, and it’s a great walk. Everyone goes to the covered food market in cours Massena in the heart of the Old Town. It's a wonderful sight –- an inspiring mix of fresh fruit and vegetables, cheese, olives, hams, and sausages. The stalls of the professional growers and traders like the cheese man Jacques run down the outer sides, while down the middle the people with smallholdings and herb gardens set up their stands. It’s a riot of color and smells and the perfect place to buy food for a great picnic. Daily June 1st-September 1st, other months daily except Mondays. 6:00am-1:00pm. In the afternoon it’s the turn of the crafts market. You’ll find painters and ceramicists, sculptures and wood turners -- of varying degrees of skill -- displaying their work in the covered market. October to mid-June Friday, Saturday and Sunday from 3 p.m. The clothes market is a real mix. Some of it is pretty downmarket, but it’s a really fun experience and you can rummage through boxes of shoes, or pick up the kind of floating white linen skirts and tops that just cry out for wearing on one of those posh yachts. All the clothes markets run from 7 a.m.to 1 p.m.
There’s also a good second-hand brocante market. It takes place in a different area of Antibes, always from 7 a.m. to 6 p.m. 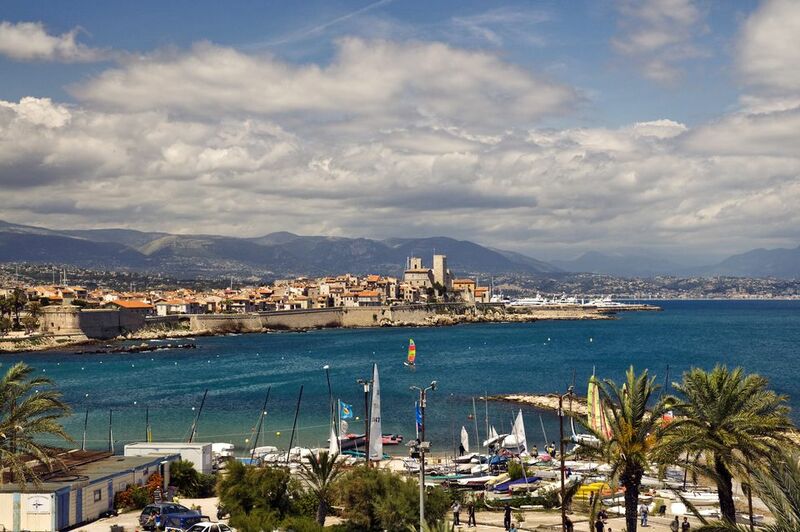 The famous Antibes Art Fair takes place during the last two weeks in April in the Pré-aux-Pêcheurs, just across from Port Vauban. It’s a major antiques and art fair, one of the largest in France, with serious traders and collectors coming from all over Europe. The beaches in Antibes and along the Cap d’Antibes vary hugely. They include stretches of yellow sand (very crowded in the summer months), pebbly long beaches that stretch out beside the road from Antibes along the coast to Nice, and a series of small rocky coves around the Cap which are wonderful for snorkeling. Most of the sandy, family beaches have minimal showers, toilets and places to buy food. On the La Salis beach make for Chez Jozy, a food stand which sells the best, freshly made pan bagnats (tuna sandwich in a roll) and French fries. When the beaches pall, make your way to Marineland just outside the main part of Antibes, though be warned –- it is quite expensive. There’s a whole raft of activities on offer, including splashing down the Shark River, looking at polar bears and penguins, meeting sea lions and watching those spectacular dolphins going through their paces.